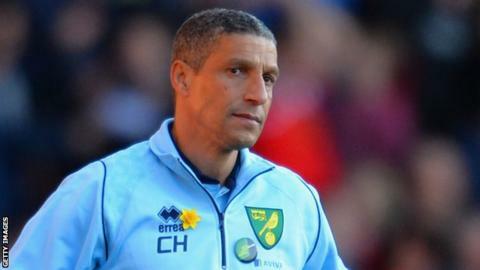 Former Norwich City boss Chris Hughton believes he would have kept the club up this season had he not been sacked. The 55-year-old was replaced by youth-team manager Neil Adams on Sunday. The Canaries' 1-0 loss to West Brom a day earlier left them five points clear of the Premier League relegation zone. "Collectively we were ready for the challenge that the final five games presented and we believed we would reward the club and the supporters by achieving that objective," he said. "I understand the recent frustrations, but I remained totally confident that we were on course to create history at the club by retaining our top-flight status and move into a fourth consecutive season in the Premier League." Hughton, a former Newcastle United and Birmingham City manager, added in a statement through the League Managers' Association: "I am naturally very disappointed to have lost my job but immensely proud to have served as Norwich City's manager." He replaced Paul Lambert at Carrow Road in the summer of 2012 and led the Norfolk side to 11th place last season, their best finish since 1993. And, although Norwich have not been in the relegation zone since November, they have lost four of their last six games and supporter animosity towards Hughton has been growing. LMA chief executive Richard Bevan said: "We are all very disappointed for Chris and in particular with the timing of his dismissal. "We must recognise that Norwich City has come a long way in a very short space of time and that just four years ago they were competing in League One. "Chris has an excellent record of managerial success, initially with Newcastle and later with Birmingham. "So it is with regret that we see one of our top English managers being dismissed without being given the opportunity to see out the season." Hughton was handed the biggest transfer budget of any Norwich manager last summer and made the big-money signings of Celtic striker Gary Hooper and Netherlands internationals Ricky van Wolfswinkel and midfielder Leroy Fer. Forward Van Wolfswinkel has not scored since his debut at the beginning of the season, while Hooper has seven from 31 games. "Over the last two seasons many new players arrived at the club and it has been a period of transition," said former Tottenham and Republic of Ireland defender Hughton. "But I would like to put on record that the commitment and work ethic shown by them, together with the players still retained from when I was appointed, has been exceptional. "The same applies to my coaching and backroom staff, whose contribution has been immense. "I now wish to reflect before preparing for the next challenge. Norwich City is a great club and I feel honoured to have had the privilege of being its manager."